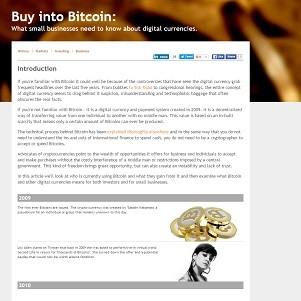 Content: Buy into Bitcoin – A guide for small businesses on how to understand and use digital currencies like Bitcoin. The client wanted to develop its presence as part of the ‘FinTech’ sector, so to achieve this we created a new section that would cover innovative financial technology. We began with an article on Bitcoin, which was particularly topical at the time (Spring 2014). I researched and wrote the content – as well as sketching out the graphics that are used within the article. The outreach process involved discovering and reaching out to Bitcoin news, blogs and forums. The content was also written with the intention of being a guide for small businesses, which meant I could also outreach to sites dedicated to small business and entrepreneurship. Results: The content earned 30 unique linking domains. It was also viewed over 3000 times on StumbleUpon.